Says international Punjabi rapper Bohemia, referring to youngsters in India and Pakistan. 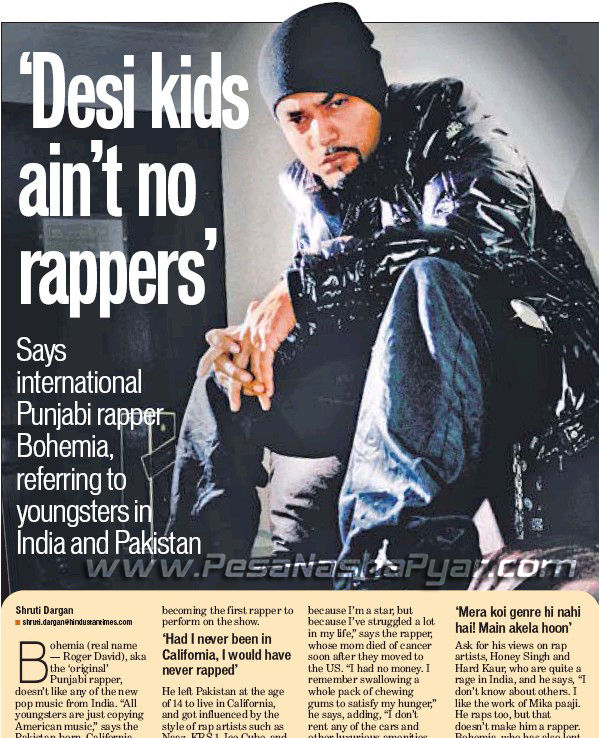 Bohemia (real name — Roger David), aka the ‘original’ Punjabi rapper, doesn’t like any of the new pop music from India. “All youngsters are just copying American music,” says the Pakistan-born, Californiabased rapper, 32. “When my friends look at videos of kids from India and Pakistan doing rapping, they laugh at them, as these kids look cheesy,” says the musician, who recently participated on season 5 of Coke Studio, Pakistan, becoming the first rapper to perform on the show. He left Pakistan at the age of 14 to live in California, and got influenced by the style of rap artists such as Naaz, KRS 1, Ice Cube, and Dr Dre. “I wanted to make music that’ll express me. The generation of rappers that’s coming up now is not doing that,” says Bohemia. Ask for his views on rap artists, Honey Singh and Hard Kaur, who are quite a rage in India, and he says, “I don’t know about others. I like the work of Mika paaji. He raps too, but that doesn’t make him a rapper. Bohemia, who has also lent his voice for actor Akshay Kumar’s songs such as Subah Hone Na De, and the title track of Chandni Chowk to China, has great respect for the actor. “I look up to Akshay Kumar sir. We keep meeting when I come to India,” he says.